Each has a painted letter on side, together they spell "boo"
Autumn. The season of sweaters, boots, and pumpkin lattes. It's a season we all look forward to. Something about the colorful leaves and that smell in the air makes you want to start making your home as cozy as possible like a squirrel preparing for winter. If you want to achieve that comfy, country feel these pumpkins will give your home the look you're looking for. The pumpkin is one of the best parts of fall. When you're driving through the country in October you'll see the orange pumpkins just waiting to be picked and hoping to end up in a good home, ushering trick-or-treaters to porches everywhere. This take on the autumnal favorite will be there to dress up your home season after season. 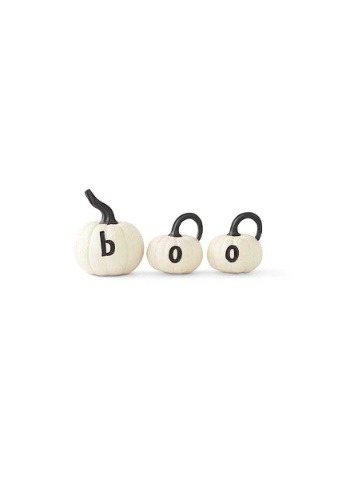 The "boo" pumpkins add a little spice to your home sweet home when you set them up where ever you like. They'll look fresh on your porch or pretty on your mantel, where ever your house could use a little extra seasonal touch. With these pumpkins, happy Halloween might just be a sure thing.